In 2014 I had the delight of presenting at ACTFL’s fall conference with Sara-Elizabeth Cottrell and Laura Sexton on the topic of personalizing instruction and assignments for students. You can see our presentation and handouts from that session here. Since then I changed schools to an innovative, forward thinking renaissance school where we are given the challenge, the latitude, and the support to rethink school and how we conduct our classes. It is very hard work, but the rewards of our efforts are starting to show. Last year was the first year for the school and a lot of effort was focused on just getting through each day. This year has been better in that regard, and it has allowed me the ability to update and edit some ideas and practices that got set aside in last year’s survival mode. One of those things is Choose Your Own Adventure, a personalized, student voice & choice assignment that asks students to use their developing language skills outside of class. In my novice and intermediate classes I generally don’t assign homework–maybe twice a month–unless it’s by student request to have more time to work on something. The exception to this “no homework” guideline is Choose Your Own Adventure. Students select their task for the week, complete the requirements, document their work on a Google form, and then on Fridays they share what they did with a small group of classmates. They are strongly encouraged to invent their own adventures, and even more if it includes family and friends. We are starting this week, so I’ve updated the packet which you can find here. 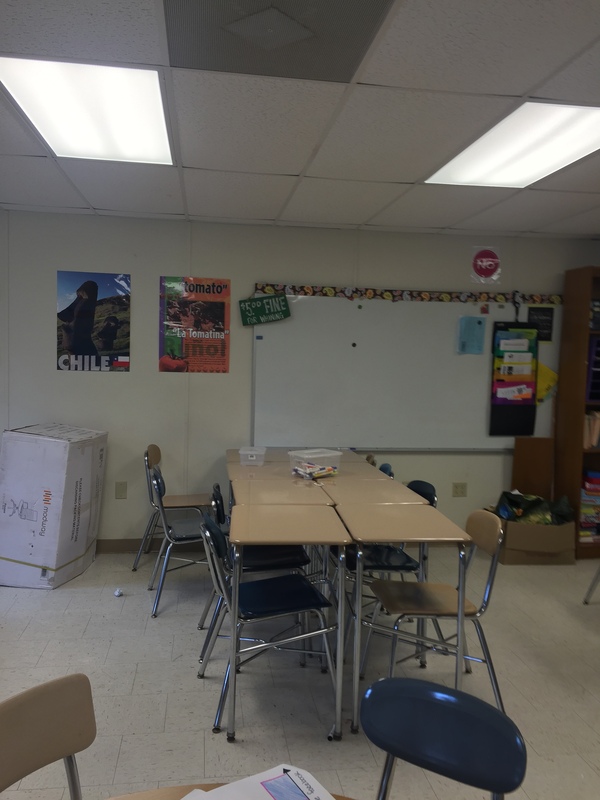 To save paper, all of this will be run through Google Classroom this year. Yay technology! Many thanks to Laura & Sara-Elizabeth for their ongoing editing and suggestions. 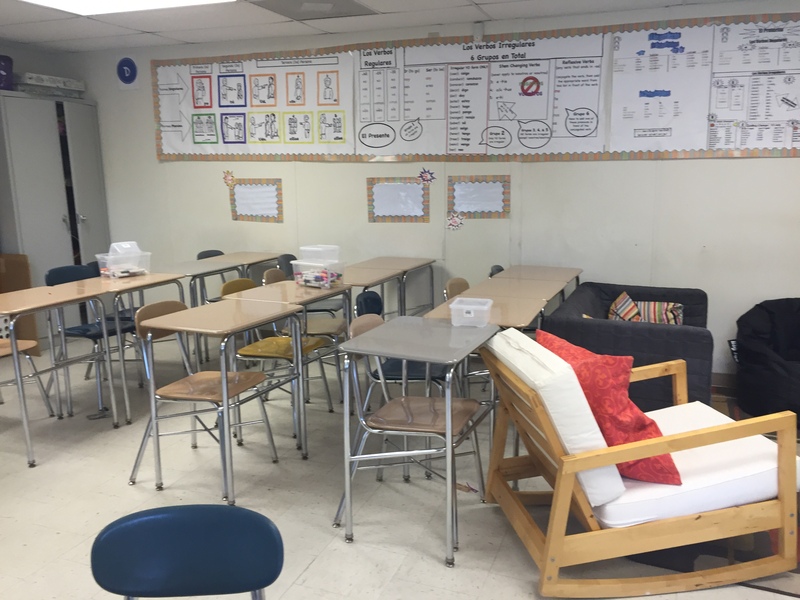 I’m a little late to the start of the year party, but thought I’d share some pics of my classroom this year. The “living room” idea was such a hit that it has now expanded to two areas. 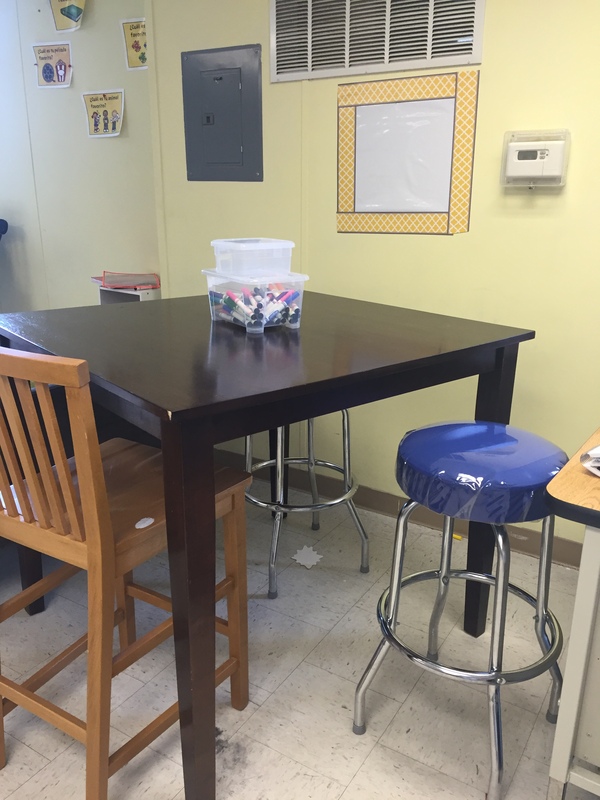 Bar height table plus spinny stools–great workspace for fidgeters & students who want to stand to work. A peel & stick decal gives the group a whiteboard. The small plastic bin is the “holding cell” for teléfonos traviesos. 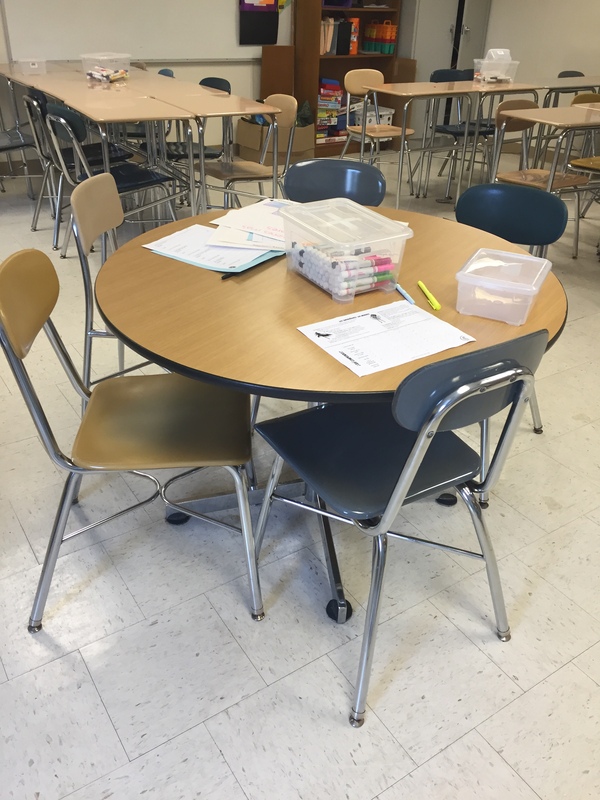 The round table in the middle of the room is awesome for small group work, a central place to pick up materials, and to be able to see the board well. 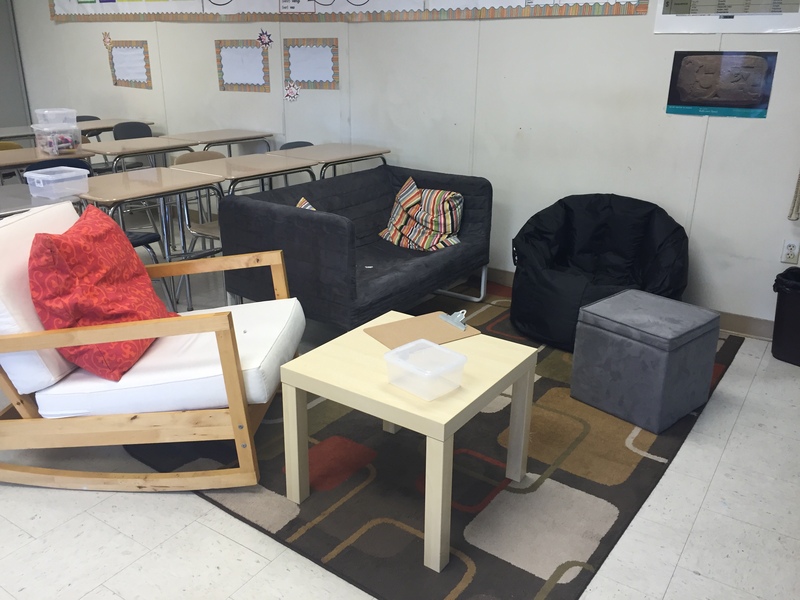 “Living Room” #2–thanks to Ikea, Craigslist, & Target. The lid comes off the gray footstool to provide additional storage. Mini whiteboard decals are on the wall in the background so that groups have a place to record their thoughts. “Living Room” #1–again thanks to Ikea, Target & Craigslist. I covered the top of the table with whiteboard peel & stick material, so it is a whiteboard table for this group. 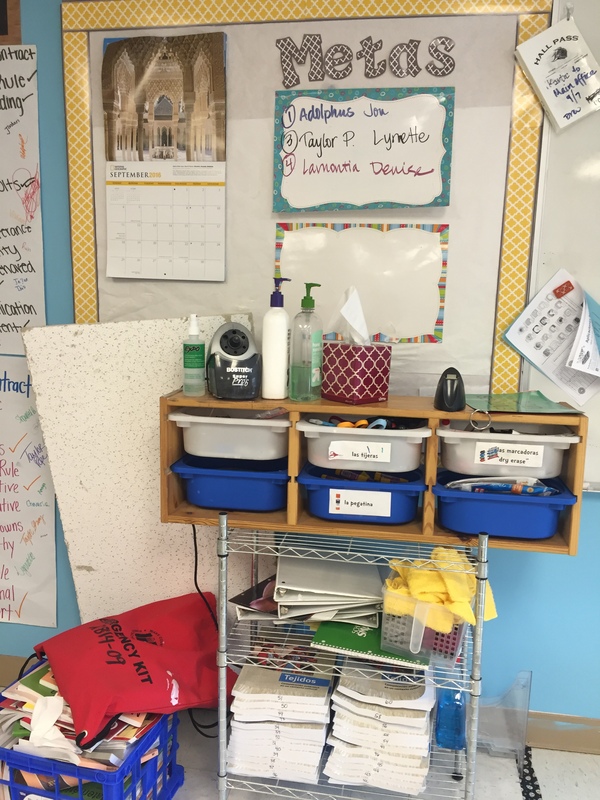 Our home base station–scissors, markers, spare notebooks, lotion, sanitizer, and texts. 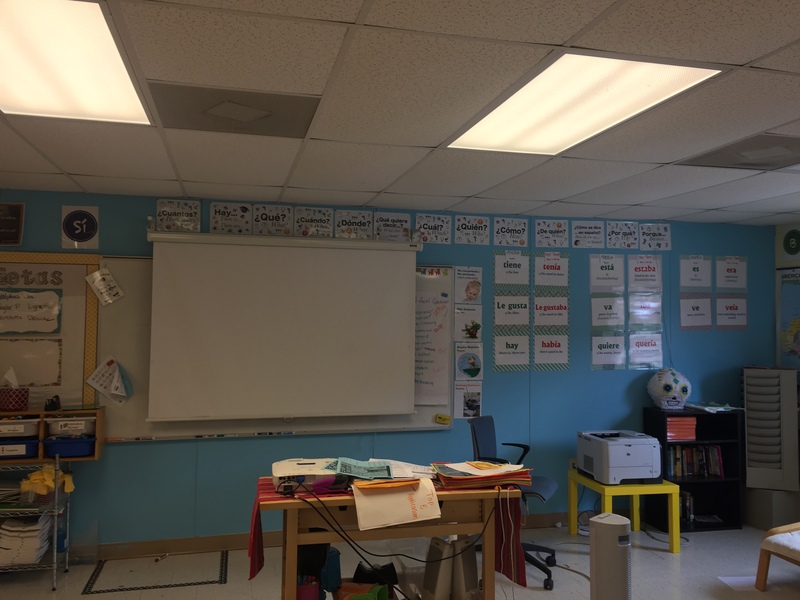 Our goals will be up here, but right now it is where I parked the names of people who have volunteered to do one of our classroom jobs. My son & his friends–and many of our students– were totally caught up in the Pokemon Go! craze this summer. I knew something was up when suddenly “taking the dog for a walk” in the heat of the US South became a daily event. We have just completed day 5 of Spanish 1 and we are currently working on greetings & introductions after having talked about proficiency for a couple of days. I’m leveraging Pokemon to give students an audience and to help build relationships with key staff members. Our school’s motto is “Every Student College Ready” and the idea of “catching” all students is prevalent throughout our work. Each student received a sheet with pictures of 8 staff members who agreed to participate in this challenge with their “Pokemon identities”–the most elusive Pokemon in the world. Now the students have a week to “catch them all” by finding each staff member at lunch or before/after school and engaging them in a basic conversation in Spanish. Some of our participating staff members speak Spanish comfortably, while others do not. Students will take on the role of teaching those who do not how to say what they need to say. Student engagement went UP when they realized they were actually going to have this conversation. It’s my hope that this will increase visibility for the work that we do in WL and also that it will open doors to positive relationships with our admin & intervention staff.